Isamu Noguchi’s Magic Chef ceiling has been hidden above a drop ceiling for decades. In what has become a recurring irony, the poor taste of 20th century corporations has been saving the day for historic buildings across the country. 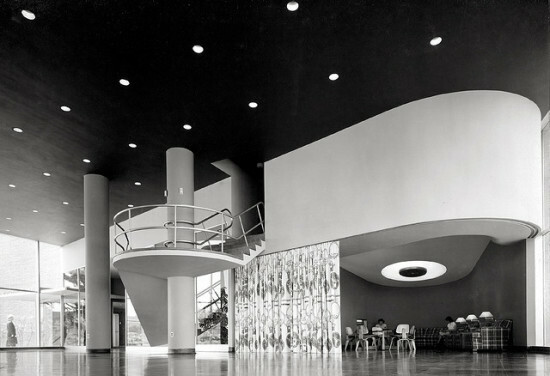 Now as companies like Walgreens and CVS rehabilitate dilapidated banks into drugstores, St. Louis might be getting its first look in decades at a historic Isamu Noguchi designed ceiling hidden above a drop ceiling in what’s now a U-Haul truck rental warehouse. The Harris Armstrong designed U-Haul building as it currently stands. Unbeknownst to many, what currently appears to be a clumsy brick and metal paneled warehouse at 1641 South Kingshighway Boulevard in St. Louis, is actually a gem of mid-century Modernism. 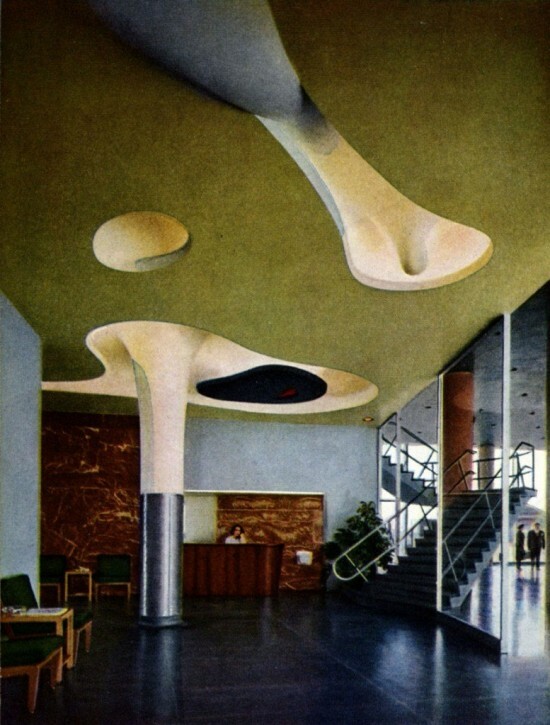 The building that now holds the U-Haul storage and rental center was originally designed by St. Louis architect Harris Armstrong in 1947 as the headquarters for the Magic Chef American Stove Company. The structure was hailed as a masterpiece of International Style design, which included an ornate curvilinear lobby ceiling designed by none other than the famed Isamu Noguchi. 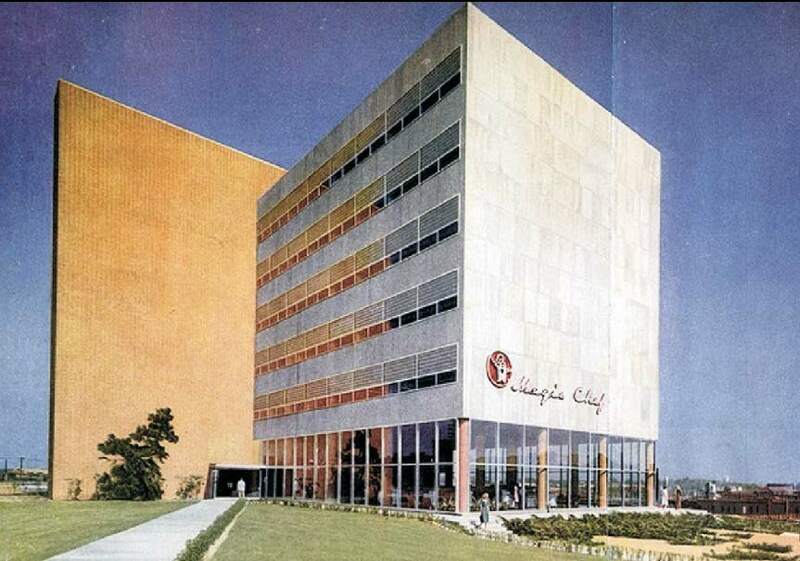 The Magic Chef building was a considered by many to be one of Harris Armstrong’s Modernist masterpieces. It was not long before Magic Chef would move away and the building would become a clinic established by the Teamsters Union. 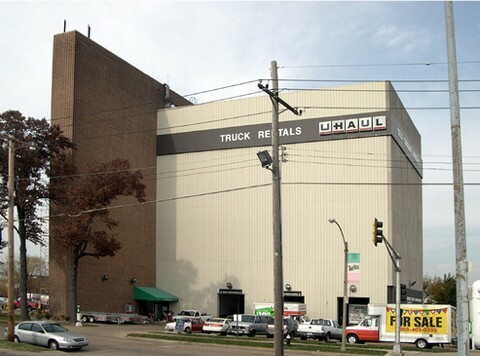 Eventually left empty in the late 1960s, U-Haul, the current owners, would come to acquire the building in the late ’70s. U-Haul would subsequently attempt to repair the now-decaying building and bring the space up to code, though with little-to-no mind towards preserving the aesthetics or architectural features of the building. It would be these very same inexpensive, and sometimes incomplete, fixes that would eventually be the saving grace of the building. Harris Armstrong’s bright Magic Chef interior. Now, at least 20 years since a drop ceiling was added—covering the Noguchi designed ceiling—and metal paneling was added to the exterior of the building—covering its glass facade—it seems that at least some of the building will be returned to its former glory. As reported by local public radio station 90.7 KWMU, U-Haul is planning to uncover the figural ceiling in the spring of 2016. This news comes as a relief to many that remember the original space, believing the ceiling had been destroyed. And though U-Haul has made no indication that they would be restoring the entire building, this move makes it clear that the building could someday be restored. According to circuit court documents from the early ’90s, it is very likely that the original windows are still under the metal paneling that now covers the building. In the 1980s, U-Haul was attempting to stop leaking windows with caulk to no avail. As an affordable solution, metal paneling was installed as a rain screen and a visual barrier into the building which holds customers’ stored items. This solution was not immediately accepted by the city’s Building Commission and Heritage Commission, and a series of hearings and appeals were held before the company was allowed to proceed with installation. Though St. Louisans won’t be getting back their Modernist oven store just yet, it is encouraging that U-Haul is recognizing the worth of a designed space. With every uncovered ceiling or facade, the city gets one step closer to having a piece of its once lost architectural history back.